To truly step up your guitar-building game, every last bit of fundamental geometry needs to be perfect. Every time. You need 100% control. The fingerboard is what most people find the hardest to nail; a badly-radiused fingerboard translates errors through to the fretwork. This then requires additional metal being removed during levelling and a poor end product. Without the right tools it can be a slow and difficult job. Precision radiusing beams are the easiest and quickest way of sanding your fingerboard into perfect form. Simply stick a length of coarse (80-100 grit) adhesive sandpaper (or using double-sided tape for normal sandpaper) to the bottom, scribble over the board with a pencil and work on removing all of the pencil marks evenly and radiusing the board symmetrically. Once dialled in, sequentially replace the paper towards finer (up to 600 and beyond) grits till the board is perfect. A fingerboard can easily be completed in less than half an hour without hard work. As of writing, the last fingerboard I radiused yielded fretwork that only had one fret in need of specific levelling work. The acceleration in workflow saves the busy workshop luthier time and money whilst giving the home enthusiast shop-quality results. 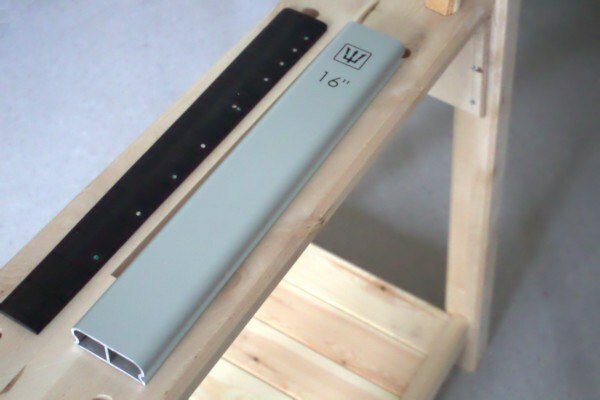 The width of the beams (70mm) is ideal for single-handed use. This easily manages 6-string and 7-string guitars plus 4-string basses. Wider fingerboards require only a little more attention, producing results as perfect as their narrower counterparts. In comparison to other radiusing beams available online, the G&W tool has a nice level of fit and finish. 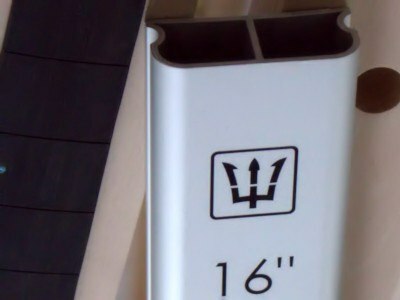 The ends are deburred to remove sharp edges left from machining operations, plus the surfaces are an appealing but simple satin with the G&W logo and radius in large clear type. The "grippiness" of the hand shaping is excellent (a couple of strips of hockey tape in the recess work great) with the weight of the beam ideal for keeping it true in use. G&W stock the most common radii (7-1/4", 9-1/2", 10", 12", 16") in both long (450mm/18") and short (200mm/just under 8") lengths with a discount for a full sets of all 5. Even including the cost of worldwide shipping, the price is still lower than the equivalent tool from Stewart-MacDonald. For European-based buyers, the price is simply a steal. Also stocked are shorter wood radius beams which are ideal for fret levelling, knocking down areas of inlay work to the level of the fingerboard or even as fret clamping cauls. G&W's comprehensive range of guitar and bass building tools, templates and essentials has developed them into an excellent one-stop shop for European-based luthiers. Their competitive pricing easily saves a significant amount of money or simply gets you more quality equipment for your budget. Precision radiusing beams are simple but essential tools often skipped over due to their formerly high purchase cost; G&W have broken this rule, allowing luthiers at all levels affordable access to shop-grade tooling. G&W Aluminium Radiusing Beam by Carl Maltby is licensed under a Creative Commons Attribution-NonCommercial-ShareAlike 4.0 International License.